The weather is cooling down outside and that can only mean one thing…it’s fall, y’all. With the cooler weather, we can enjoy more soup, and that’s always a good thing, right? 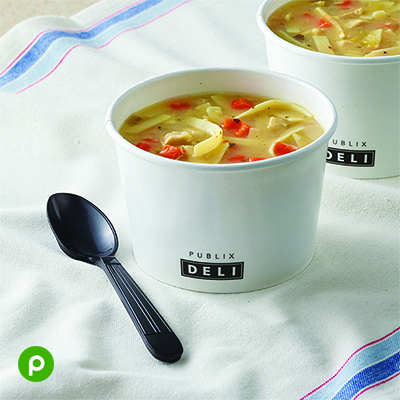 Chances are, you’ve seen our Publix Deli soups. When you’re in line for your sixth Chicken Tender Sub (of the week, we’re not judging), you smell the delicious aromas of fall, look over and see those glorious Deli soups just waiting for you to dive right in. So, what’s the greatest thing about our Deli soups? The flavors change daily, and differ at each location. Did you know we have approximately 15 different soups to try? That’s almost three weeks of different lunches. Add in all our delicious Grab & Go options such as salads and sandwiches, and you will have a large variety of different offerings to enjoy for lunch and dinner. All our Holiday LTO (limited time offer) soups are organic! This season, our limited-edition soup is Kale & Sweet Potato. This unique organic creation combines kale and sweet potatoes, simmered in a hearty stock with kidney beans and select vegetables. It doesn’t get any better than this. For more information about the daily schedule, we suggest speaking with a Deli associate or Manager. Listed below are some of our favorites. For a full list of Publix Deli soups, visit our website here. If you love to cook, our Publix Aprons website includes recipes for delicious sandwiches you can make at home to pair with your favorite Publix Deli soup. Have you tried a Hot Dog Cart Grilled Cheese with a tomato soup? It’s an updated twist on a classic combination. Another pair we love is the Broccoli Cheese soup with a turkey avocado panini. For a lighter option, try the Spring Vegetable soup with the Lentil Burger with Cool Avocado Salsa. It’s a better choice that’s as enjoyable as it is easy to make. With more than 15 options, there’s something to keep you warm in these cold months. Let us know in the comments what soup you’re most excited to try first!